83% of marketers believe that a cross-channel marketing strategy is critical to creating a successful marketing campaign. A well-delivered cross-channel marketing campaign is about understanding your customer first – their demographics, past purchasing history, needs, wants, and more. Every consumer has their own preferences. So, it takes a unique path to purchase that involves a variety of devices and channels, both online and offline. Consumers engage with brands using a wide variety of different platforms and mediums. You need to engage your customers where they’re at and with a consistent, unified experience. A unified experience across channels will strengthen your brand and make it easier for customers to engage with your company. 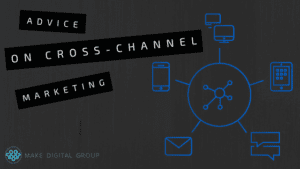 There are many channels to keep in mind when using cross-channel marketing. Website or landing pages, social media, email, in-store promotions, paid advertising, direct marketing, mobile apps, calls, print, and rich media are all options. Cross-channel marketing simply means that you are marketing with a consistent identity across every channel. The messages that you are trying to get across should be unified. Especially important in relevant cross-channel messaging is essential to establish a connection with customers in a crowded digital space. To make cross-channel marketing successful you need visibility, measurement, personalization, and optimization. Cross-channel success is really thinking about the different touch-points of the customer lifecycle. Then, using a variety of channels to engage with relevant messages at scale. First of all, in order to understand a cross-channel approach, you have to concentrate on the individuals, not the variety of individual contact points. Stop thinking of customers as an email address, a phone number, or a cookie tracking id, and start thinking of them as people. People with multiple touchpoints. When you look at it like this, it is a lot easier to understand how all the different channels, when working together, can help and support one another. See, a person may have up to three email addresses, a mobile number, and two social media profiles. To get a cross-channel view these touch points along with its data need to be combined until you have an understanding of the individual, rather than a list of channels. This is known as the “single customer view.” Once you arrive at the single customer view you are in the position to treat people as individuals. This leads to segmenting those customers and treating each segment in the ways that best suit them. Furthermore, everyone is different — regardless, not everyone will respond the same to your messaging, offers, or products. Combining segmentation with cross-channel means you can remove people who are unwilling or unlikely to ever be your customers; this increases the effectiveness of your campaigns. The key here is that you should be improving the customer’s whole experience throughout your marketing efforts. Hence, segmenting will help filter your audience and give them the best experience. If you are in a situation where you think you are running cross-channel take a step back and ask yourself if you are treating each customer as an individual or as a series of contact points. Are those contact points joined up? If they’re not then it’s likely you’re running a multi-channel approach and you need to up your game to stay ahead. Finally, the world of marketing is ever-changing — as we explained cross-channel marketing is fundamental to achieving the ultimate customer experience. Most noteworthy is that the brands or businesses that don’t keep pace will quickly fall behind. If you feel like you aren’t keeping at pace, digital marketing agencies are here to help.